For the past 20 years, have been highly regarded as one of the most influential groups in Australian hip hop. Being the first group the rap in Australian accents, they set a precedent that artists to this day are still emulating. 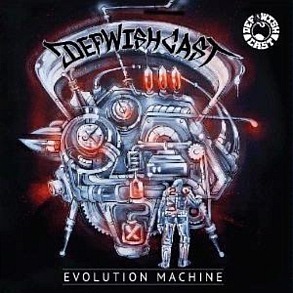 Their new album Evolution Machine continues in the tradition of classic Def Wish Cast – rapid triple time raps, strong use of MPC/drum machines and plenty of cuts and scratches. As well as the tried and true elements they are known for, they have also added the inclusion of Thomas Rock as the vocoder, contributing the old-school electro-funk sound they are highly influenced by. Rock’s contributions are no more evident than on the title track, which sees the vocoder play an important role in creating the track’s melody and hook. The album kicks off with an introduction entirely created from the beatbox from Tom Thum before it kicks into gear. DWC employ some unexpected producers on here to change up the conventions of their sound. M-Phazes lends his skills to Rock On, as we see the two teaming up for contemporary production over 80s style flows. The album also features several other producers including Resin Dogs and Katalyst. As well as all these beat-makers, the one most worthy of mentioning is DJ Murder 1, who also DJs for Def Wish Cast. He produced and provided cuts and the track Rhyme Animals (Scientific Mix) while also contributing in many ways. Similar to Rock, Murda 1 is also new to the group, and his presence is unmistakable throughout the record. His cuts are extremely precise, crisp and ooze so much energy that they help create a more polished and complete sound. The inclusion of Joyride on The Possibilities is also an interesting collaboration as it showcases the dynamics between him and Thomas Rock, both making use of the vocoder. Sereck, Die C and Def Wish have put out a brilliant album that harks back to the likes of late 80s hip hop like Beastie Boys and Run-DMC, while simultaneously delivering a unique sound of their own.